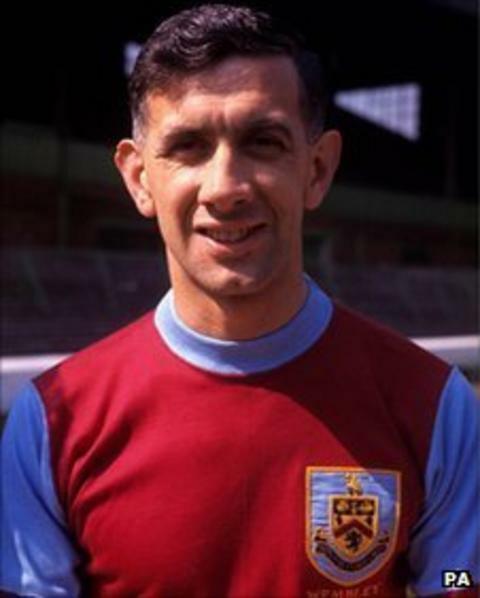 Burnley legend Jimmy Adamson, captain of the Clarets' 1960 title-winning team, has died at the age of 82. Ashington-born Adamson played 486 games in a one-club career spanning 17 years, sixth on Burnley's all-time list. Best remembered as Burnley's ever-present skipper in 1960, Adamson later rejected the chance to manage England. Adamson also spent six years as Burnley manager, leading them to promotion from Division Two in 1973 before going on to take charge of Leeds and Sunderland. "Burnley Football Club is sad to confirm the passing of a true club legend in Jimmy Adamson," read a club statement. "He gave three decades of magnificent service to the Clarets." "He was a top man," said former Burnley director of youth development Martin Dobson, appointed Clarets captain by Adamson. "I was still quite young at the age of 22 when Jimmy asked me to be captain of Burnley. "I must admit I told him at the time I would find it difficult to tell the players what to do," Dobson told BBC Radio Lancashire. "But he made me feel comfortable and confident when he told me I would grow into the captain's role and that I should just get on with playing my football. "He was the coach and had just finished playing at Burnley when I arrived at the club. "And I was very lucky to come into contact with him at that time. "The players who were around at that time got the benefit of his knowledge and were taught to play the right way. "I only saw him once or twice a year but I never forgot to tell him that he made my career in football. Playing under Jimmy Adamson was an honour. He made me a better player. "He was an incredibly loyal man too because he turned down the England manager's job to remain at Burnley." Recruited from youth football in Northumberland, Adamson joined Burnley's groundstaff before signing a first professional contract with the Clarets in 1947, aged 17, although he did not make his senior Clarets debut until 1951. Despite finishing on the losing side in the 1962 FA Cup Final, Adamson was named footballer of the year and, at the age of 33, was included in England's squad for the World Cup in Chile that summer. Although he never won a senior international cap, Adamson acted as Walter Winterbottom's assistant during the competition and was offered the role of England manager, only to turn it down because he felt he lacked experience, leaving Alf Ramsey to take the reins of the national team instead. Having been coach to title-winning Burnley manager Harry Potts, Adamson took over in the hot seat at Turf Moor. Although the Clarets were relegated at the end of his first season, he led them back to the top flight two seasons later, while at the same time maintaining Burnley's proud reputation as a conveyor belt of young talent, maintaining the club's strong scouting link with his native North East. After leaving Turf Moor in January 1976, Adamson then had a short spell with Sparta Rotterdam before returning to English club management to take over at Sunderland in December 1976. He just failed to stop Sunderland getting relegated that season before moving on again in October 1978 to replace Jock Stein at Leeds United, where he spent two years at the helm.